Providing you the best range of horizontal cylindrical sterilizer with effective & timely delivery. 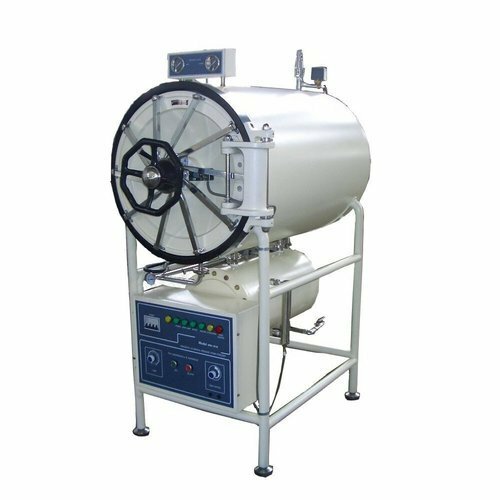 Backed by the assistance of our experienced professionals, we provide our precious clients with an innovative collection of Horizontal Cylindrical Sterilizer that is used to sterilize liquids with low moisture content and also for treatment of medicated powders. Our sterilizers are generally used for sterilizing and dehydrogenation glass and metal ware including ampoules, injection bottles, infusion bottles and production equipment. These sterilizers are in accordance with GMP standards & temperature uniformity in the entire chamber is guaranteed. Total cycle time only 4 hrs. Electrically heated by special flange type/immersion type heaters bearing ISI mark, to work on 440 volts three phase 50 cycles. Looking for “Horizontal Cylindrical Sterilizer”?